Today, after breakfast and a morning of packing up our base camp, we received word that Ferran, Thomas, Yannick, and their HAP, Sadiq, had arrived safely back to base camp after their summit bid. After lunch, I walked up to their camp to congratulate them and ask about conditions. 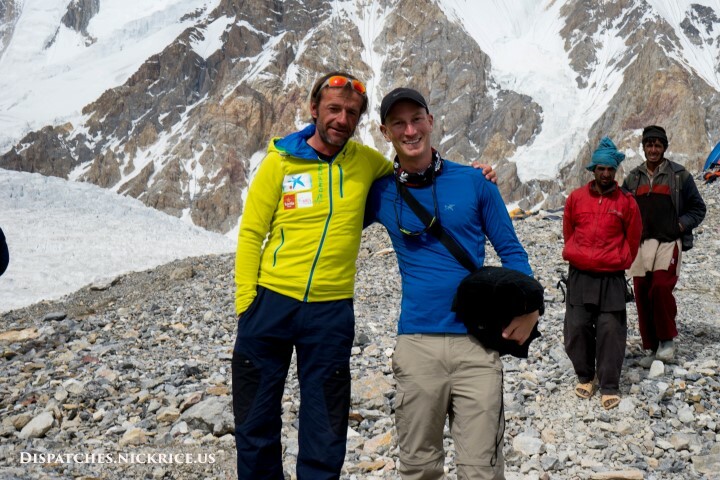 Ferran said that in all of his expeditions, this mountain was one of the most challenging and that the team had faced deep snow and an exceedingly long summit day. I also visited with Kinga who was in contact with the family of the missing Polish climber. Afterwards, Harald and I headed back to our base camp where we finished closing everything down and made sure not to leave any trash behind. The late afternoon became extremely windy and nearly blew away the mess tent. We secured everything down and went inside as it began to snow. The donkeys arrived in the evening along with a few porters. We had a quiet dinner and went back to our tents for our last night’s sleep in base camp.